"Dreams of the Peaceful Dragon"
We have just returned from our seventh visit to Bhutan. Karma Tenzin has been our guide for each trip, starting in 1996! As on every visit arranged by Karma's Jeroma Tours, every litlle detail was planned meticulously according to our requests. We made an ambitious 15 day visit, travelling countrywide from west to east, primarily to attend the festival at the remote temple Gomphu Kora. Our driver on this occasion was Karma's elder son, Kinley, who did a fine job. He was skilled, cautious, careful & utterly courteous throughout the trip, going out of his way to give assistance whenever he could. As with any journey in Bhutan, there were challenges requiring adaptations, and, as always, Karma adjusted arrangements according to necessity, ensuring an easy and comfortable experience in all respects. We had a wonderful time in every aspect, and heartily recommend Jerma Tours to any prospective traveller to Bhutan. I have just returned from Bhutan, the most beautiful country in the world. The scenery in the Himalayas is magnificent, and the Bhutanese people aare the loveliest, friendliest, most helpful people you could meet. My guide was a man called Karma, and he picked up on the type of person I was, and tailored my holiday to suit my tastes. I had the most adventurous time I could imagine, met, shared life with the local people, and did some trekking and camping out, spent some time in Thimphu, the capital, shopping. Karma was always somewhere around, but unlike a lot of guides in other countries, did not crowd me, so, although I was safe at all times, I felt free to go where I wished. If you want a holiday you will always remember, I suggest you email Karma via this website. I have been three times now, and look forward to going back in the future, and will be contacting Karma for the next trip. End of November 2016 I saw pictures of landscapes of Bhutan...at that moment I decided I had to go there. Then I began to see ads that offer travel on the Internet, many of which offer trips to Bhutan. But every time I call their phone number, none have replied. Then I remember Karma Tenzin, one of the brother's pen friends, he lived in Bhutan and had a job as a tour leader. After chatting via skype...we agreed, I would use his services to manage my tour of Bhutan. Finally I managed to visit Bhutan, from 2 February to 12 February 2017. Bhutan provides an atmosphere very different from the atmosphere in Indonesia, the atmosphere was like in the ancient story in Chinese movies. Buildings or temples seem so old, high and of course beautiful. The views at the farm were lovely and certainly different from the farms in Indonesia. Although the first 3 days in Bhutan I found it a little difficult to eat. (Not yet familiar with the aroma of Bhutan), but on the farm I feel that what is cooked by the girls who lived in tasted delicious. And I liked, a few days of the tour that I live there, hiking into the hills surrounding the village, going up the hill with a height of 3 km, tiring but impressive, due to fresh air and beautiful places visited. For all the wonderful and memorable experience while in Bhutan, I say thank you to Karma who has shown the beauty of Bhutan to me. Karma made my wishes come true, to see Bhutan. Hopefully, others may have as memorable experience as I did. In June, we made our sixth visit to Bhutan. All of our visits, beginning in 1996, have been organised and guided by Karma Tenzin. That in itself shows the esteem we hold Karma in. We were met at Paro airport and after spending a pleasant couple of days in that delightful town, including a visit to the historic and sacred Kyerchu Temple, where a festival was being celebrated, and a must-do climb up to see the famous Taktsang Hermitage on horseback, we set off to visit the Haa Valley, travelling over the highest road pass in Bhutan Chele La (13 000ft). We had a delightful stay in a farmhouse, where we were treated to a traditional hot stone bath, before the fascinating drive back down to the main Paro Thimphu road en route to the capital. We had a couple of nights in a very nice hotel in Thimphu, with good meals in local restaurants and a visit to the oldest dzong in the kingdom on the outskirts of town. Then we set out for the long drive to Bumthang, overnighting near Wangdue in a delightful lodge with great views over the dzong, which is being rebuilt following a disastrous fire devastated it in 2012. We travelled on to spend a night in a room with a spectacular view of the dzong in Trongsa, and then we headed off for the Chume Valley to visit a festival at a small but important temple at Nimalung. En route we stopped off to visit Chime temple, associated with the Divine Madman. Although the roads were terrible, as always in the rainy season, we had been provided with a high quality 4WD vehicle and an excellent driver. As usual, we pleased Karma and showed respect for the Bhutanese culture by wearing traditional dress to the festival. Following this, we moved on to visit another, very important annual festival, held at the sacred Kurjey temple in Bumthang, staying at a very pleasant lodge outside Jakar. Enjoying the festival enormously, it was time to head back east to reluctantly take our leave of Karma and family and fly home. It was a hugely fascinating, inspiring and fun trip. Everything was organised perfectly by Karma as always, who continually went out of his way to respond to our interests, likes and feelings with great sensitivity and generosity. Karma's Jeroma Tours and Treks company is entirely reliable, organised, knowledgeable and experienced, and we could not recommend them more highly. We were a couple in a "mini-group" for a very nice week in Bhutan. Karma is extremely hospitable closer to our own place and nation. Our weekly program was good, varied and planned for conditions adjusted to the country. Nevertheless, it was possible to still incorporate our suggestions towards small changes. Karma organized everything admirably and with great empathy when it came to our wishes and expectations. It should be emphasized that he also took into account highlights, and built into our plans the temple festival in Paro. That was an absolute hightlight of our trip, that we probably would have missed without Karma. Karma has brought us closer, more knowledgeable and absolutely in tune with his country, which we alone could never have experienced. In March 2016, we spent a ten day trip through western and central Bhutan wonderfully organized by Karma. Karma was very flexible, to take account of our spontaneous desires. So we thought of only in Trongsa to exchange a stay in Haa valley against Bumthang including the necessary changes to the hotel stays. He advised us well, what works and what does not. to follow his advice, usually recommended especially in view of the disastrous road conditions if you want to not just sit in the car. The highlight was certainly the Tsechu in Paro, the Karma had perfectly inserted in our trip planning. Finally, we were even twice for dinner at his house, one of which should be a Puja. In short: Karma offers a lot more than one can expect from a tour operator and is extremely well informed, especially in all respects to Buddhism. Jeroma Tours I can only recommend without reservation! We had a wonderful time in Bhutan in February 2016 organized by Jeroma Tours' Karma and his son Kinley Dorji. The tour was designed according to all our needs, such as a brilliant spiritual explanation of the main principles of Buddhist philosophy, delicious food in the local places, and a pleasant immersion in the local preserved culture. An additional big thank you to our driver Ugyen Dorji for his fantastic hospitality and great sense of humour. We were well treated in Bhutan with lots of love and happiness. 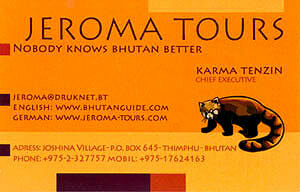 We strongly recommend Jeroma Tours for your future trip to Bhutan. My friend and I just spend our first 6 days in Bhutan ever, guided most ably by Karma Tensing. He was a fantastically experienced, organised and friendly guide. Unlike many guides Karma knew just when to interject or adjust the itinerary and when to leave us to enjoy the magnificent sites and scenery by ourselves. We got the impression that Karma is one of the most experienced guides in Bhutan. He was certainly able to share a great deal of fascinating cultural information but also listened carefully to our requests when it came to specific things such as food, accommodation etc. I cannot recommend Karma highly enough, he was definitely one of the reasons we had such a wonderful first trip to Bhutan. All the very best Karma! In February/March 2015, we had 16 wonderful days together with Karma in Bhutan. The organisation was straightforward via email, and Karma arranged and implemented our wishes, ideas and suggestions in the itinerary well. Core were 2 days at the fantastic festival in Punakha. During the Druk Trek, unfortunately we were stuck on the 2nd day in 30cm of snow, but were well equipped andcould turn back safely. In terms of culture and Buddhism, Karma is a very competent guide. We cannot recommend him highly enough. One evening he invited us to his home where his wife had cooked a delicious meal. Dear Karma, thank you very much !! Thanks, Karma, due to your good organisation we know Bhutan really well, especially in the world of Buddhism due to all the temples we were able to visit. Karma looked after us competently and with kindness. We will be back. Our complete crossing of Bhutan in April 2014 was organized by Karma wonderfully, although he could not be with us himself during the entire tour. He had, however, taken good care for replacements (guide and driver Dorje). They were relatively flexible during the tour and so could be responsive to our needs. A very successful trip. Jeroma Tours and Karma are just great. In February 2014, we spent ten wonderful days in Bhutan. With this trip, we realised a dream of ours. In Karma, we had an excellent guide who modestly knew all about his country, culture and customs. We also had the privilege of eating one evening with his family. To have Karma as tour guide is highly recommended. Bhutan is a country that has fascinated me for a long time . I had read many years ago about it and that one or other banking students' dissertations dealt with the gross happiness concept. I decided I should go in June to Bhutan . Because of my master's thesis there remained for me little time to prepare for my trip. I found in Karma an incredible talent for organization . He arranged for me a trip that matched my requirements and desires, organized visas and even solved problems with the flights. And all this in a lead time of about 3 weeks before the actual trip. Although I did not personally travel with Karma but two of his employees, I had during my stay in Bhutan regular telephone contact with him, in which he inquired regarding my feelings and satisfaction with everything. My trip to this country and especially with Karma was a huge success, and I can only recommend anyone to arrange their journey with the Jeroma Tours organization. I will definitely organize my next Bhutan trip with Karma and hope for a personal encounter with him then. Tashi Delek. We had our fifth Bhutan adventure with Karma Tenzin in October 2013, when we flew into Paro and drove to Bumthang in central Bhutan to attend the Jampa Lhakang Drubchen (religious festival). As always, Karma's planning, organisation and attention to detail were impeccable, so we had a wonderful time and an unique cultural experience. Karma is the perfect guide and companion. We cannot recommend Jeroma Tours too highly. A big thank you to "Jeroma Tours" who organized our wonderful trip to Bhutan. We were dazzled by the stunning scenery and the incredible variety of nature, but also by the power of "Dzongs", peace of the monasteries, the charming villages, the beauty of the architecture, the friendly people. .. They enclosed a small mystical air while making the atmosphere very refreshing, especially compared to the rampant materialism that reigns in the Western world. For convenience we must say that the price of the trip was reasonable, comfortable car and the route that matches our desires despite some surprise that was part of the decor. As for the food it was adapted to our stomachs, hotels were nice and charmingly welcome. In this chapter, we especially want to thank the "manager" Mr. Karma and his nice family and friends for their homey home. Big thank you also to our two guides, guide, Ngawang and the driver, Namgya. Their efficiency in the management and generosity in the effort made possible the beautiful and rewarding ten days we spent with you. In my case, I can say that there will be now a "before" and "after" Bhutan. And maybe the "in situ" reflection on the concept of "gross national happiness" there is also something. We travelled to Bhutan in June, 2013 for 15 days with Karma as our guide and organizer. Karma knows his country, culture and religion very well and was warm and helpful in imparting this information. He was able to alter the itinerary at short notice and always with a smile. He was patient, considerate and a wonderful story-teller, especially in retelling Yeti-stories with his impeccable sense of humor. We thank Karma and his organization and recommend him to others considering a venture into Bhutan, its culture/history and into Buddhism as a religion and way of life. From Bangkok, we travelled in April 2013 for 3 days in Bhutan. At Paro airport we were greeted with warmth by Karma and then immediately brought to our hotel. The stay in Bhutan was an impressive experience for us thanks to the perfectly put together itinerary of Karma. Thanks to Karma and we wish him continued success. In March, we came up with a big dream, to visit Bhutan. Via the internet we found a website that convinced us that Karma was the person to arrange this. We comprehensively thank Karma for his decades of experience, and his maximum attention to both past and present of this beautiful little country, its Buddhist spirit, its natural treasures and its people's culture. We started at the border town Phuntsholing and after Paro and Thimphu travelled to the east to Sandrup Jongkar. It was a great privilege for us. Karma hosted us at his home, and we got to know his family. The guest houses we stayed at during our visit fully met our expectations, the staff were all helpful and friendly, and Karma's attentiveness, calmness ("no problem" )and excellent organisational skills meant we had nothing else to do but abandon ourselves to the enjoyments offered to us by the country. Many thanks to Karma and his team. Tashi Delek. We were a group of seven people and had chosen the end of September/early October for our 14 days in Bhutan, a very reasonable period of time - still nice and warm, no rain. In a long preparatory phase, there was an intensive email contact with Karma and he went as far as possible to meet our special requests. So we visited several temples and monasteries that are a bit off the usual tourist programs, often we could meditate undisturbed as the only visitors, or attend a puja by monks or nuns. Also a desirable meeting with a Karma Rinpoche was made ​​possible. And although the routes needed a lot of time because of bad roads, Karma had considered our vision and we met regularly for walking, finding in this way a direct contact with this wonderful country, its places of power, friendly people, and peaceful animals. Karma taught us a lot about Buddhism, for all other questions he was open, and in the evening he showed us with his whimsical Yeti stories his humorous side. He lovingly cared for our well-being, like a sore throat wanting warm milk with honey, and in a room problem (noisy neighbours) he immediately offered his own room, on the way to Tiger's Nest, he took over the heavy backpack of a fellow traveler. I also want to mention thanks to our young but very skillful driver Dorji, who took us on a small bus through the country, and in tricky situations was not fazed, sometimes singing to music on the radio and played in the breaks on his flute - this was appreciated by us all. Overall, it was an incredibly beautiful and very unique journey into the peace and the silence. Thank you so much, dear Karma. We were granted the good fortune to visit Bhutan in March 2011. Karma Tenzin, thank you very much for your patience and quick response to all of our questions in preparation for the trip. We have also learned to appreciate his talent for organization. Among other things, he has allowed us to spontaneously have an unforgettable experience: a "hot stone bath" (hot lava stones placed in the water). Although this holiday was not very long, we feel we have received a very deep insight into the life and environment of this country. Karma, our guide and interpreter, has lead us confidently in the German language and thereby spared no effort to fulfill our wishes. We are also very grateful to have had the benefit of Ajid, a reliable, considerate and always helpful chauffeur. The strong impressions and experiences of this trip, we will keep in our hearts. To visit Bhutan once more would make us very happy. Once again, Karma Tenzin and his staff are warmly thanked, together with best wishes for health and welfare. A journey into a wonderland that was only a beautiful dream. Karma and his driver have made ​​my 10 days in Bhutan an unforgettable experience. It was worth every single penny and I would make this trip at any time. Karma really could read every wish of the eyes and was fully addressed to my needs. His driver, who has a very good and safe driving style, ensured this trip was a success. From my deepest heart a big THANK YOU dear Karma. Thanks to you I have become incredibly fond of your mystical country with its understated but incredibly warm people. Thank you to Karma and his team for a very successful short visit to Bhutan. In three days he has reported so much about the country and people that I have the feeling of having been there much longer. Lots of information. Super help with visa. Great accompaniment. Absolutely perfect! 10 DAYS IN HIMALAYA PARADISE From 08 to 17 October 2010 we were allowed to travel through the small Himalayan paradise Bhutan. As a professional photographer it is very important for me to spot a local contact person to whom I can leave myself 100%. With his quick apprehension and proactive manner Karma Tenzin quickly understood me and my work. Karma was an absolute stroke of luck in the usually rather laborious preparatory work with Visa, flight, etc. He has supported us and respond within a very short time on our e-mails. His preliminary work was immaculate and very efficient! With his support, it was possible to make such a special trip in a few weeks on the legs. We were also pleased that we directly support a local business, Jeroma Tours in the country, and give up a travel agency in Switzerland. During the trip it all worked perfectly and we were more than satisfied with the service from Jeroma Tours; Karma is an excellent organizer, the desires of its guests can still read from the lips without being intrusive. His quiet, very serious but in no way passive manner was extremely pleasant and very efficient. Above all it was me in my photographic work he is a very good help and could give me valuable tips about lighting conditions, specific locations etc.. In portrait series of the local population, he has also actively supported me and done an excellent job I would have never expected and I have on all my photo trips never experienced in this type! Karma's advantage is that he has lived and studied for extended periods in Europe. In particular, I would also like to point out Karma's flair in the choice of accommodations and restaurants. We always stayed in very tasteful guest houses and thanks to Karma, good contacts with the owners, even now and in unique suites. Karma has a very large general empathy and would do anything for the welfare of his guests. We have seen wonderful 10 days in Bhutan and loved this unique country! We will certainly return again - but this has only been organized by Karma :-). The photographic result of the photo tour is to see from now on my website under the heading newest portfolio. (Please search my website with "ORTHart Photography" in Google) Have fun and Tashi Delek! We travelled from 16.10. until 02.11.2010 from Samdrup to Paro with Jeroma Tours. Our guide Chencho and driver Ugyen gave us a holiday in a class. We got to know the country and especially the friendly Bhutanese well and had fun with them. The organization was perfect and extremely flexible, even beyond the program. Actually we were already read every wish from your eyes. In the temple festivals, we always had the best seats, the car, hotels and even the weather was ok, we did take care of anything. Highly recommended. We'll be back. We had a wonderful trip in Bhutan with our guide Kelly. Everything was perfectly organized and the first cultural week, we had competent information about the country and people. Thanks also to the crew on our Jomolhari Trek. The weather was sunny and we had an unforgettable experience. Then recommend anyone to travel with Jeroma Tours travel. We will come back safely. Gigantic Snowman Trek. We, Frieder, Reiner and Thomas from Jena in Germany completed the Snowman trek in October / November 2010. This trekking tour was a big challenge and one of our most impressive adventures. Passes and camp sites over 5000m, back country villages near to border of Tibet, unique world of mountains and nature! The perfect organizer of this tour was Karma Tenzing, who took part. Thank you very much Karma. You and your team (Assistant Nidup and Kolo, Samten cook, horsemen and Phurba Dawa) were excellent! It was my fourth trip Bhutan organised by your tavel agency and be sure it will not be the last one. Tashi Delek, Karma! Anyone who makes a journey through Bhutan with Karma Tenzing has hit the jackpot. We were so lucky. It was an unforgettable trip. From 16 - 30 September, we travelled with Karma and his friendly driver Ugyen in a very convenient drive from Paro to Bumthang and back. We participated in three fascinating temple festivals in Thimpu, and, in Bumthang valley, Gantey and another. Karma took care of us photographers with super seats, folding chairs conjured out of the trunk, and sometimes he surprised us with hot lunch in the temple, on the raging riverside or in a remote mountain valley. Through him, we could also find access to the people in mountain valleys, who did not speak English. He also brought to us his Buddhism religion, his unobtrusive way brought it closer to us and gave us an insight into the culture of his country. Karma has a natural caring and sensitive attitude to the diverse interests of its guests. His incredible experience and knowledge make him the perfect guide. His previous visits to Europe helped him bring things to us through the eyes of a foreign visitor. We were very restrained and his human nature and its flexibility excited us. More than once we were more than surprised that he had very quietly in the background arranged something "very secret" for us. We want to emphasize the reliability of Karma. The preparation of our trip, i.e. procurement of visas, airline reservation with Druk Air and the financial management of a bank account in Germany were absolutely precise and easy. We hope to keep in touch and to stay friends with him, and to know how his nice family and Jeroma Tours develop. Thank you, Karma. Tashi Delek! 09/22/2010 to 14:10:10, we were up in Bhutan with Jeroma Tours. It was one of the best trips to date. We were, after 2 days at Paro, initiated to the 7 days (partial) Jomolhari trek. It was a fantastic experience and the whole team was just great. Our guide Rinchen, the chefs, the people who looked after the mules, everything was perfect. Also, the onward travel until after Samdrup Jonkar was tops, with Chencho Ulgy as guide and as a driver. We have seen so many beautiful things and had great experiences, we can only recommend Karma. We also hope to come back again sometime in April when the blooms are out .... Rhodondendren. Tashi Delek and thank you !!!!! Our 7 day journey through Bhutan was hands down the trip of our lives, all made possible by Jeroma Tours. We couldn't have asked for a more perfect guide to take us around such a magical country. Karma's kindness, flexibility, attentiveness, attention to detail, and incredible knowledge of the region and its people makes him a guide in a league of his own. Our experience was truly authentic and never felt like we were on a "tour", but instead felt like we were being shown the real Bhutan by our Bhutanese friend. Everything about our journey exceeded our expectations and we did not have to worry about one single thing because Karma was taking care of us - the ultimate vacation! Thank you Karma and Jeroma tours for such an unforgettable experience, we can't wait to come back! Tashi Delek! We visited Bhutan in April / May for 15 days. This fascinating and varied trip was led by Karma Tenzin. His slogan "Nobody knows better Bhutan" we can only confirm after this trip, he really knows every corner of this country. We passed through Bhutan from West to East and back again, seeing it only as a friendly and open-minded people, we were invited by a local family for tea, visited the first celebration of a new house, took a hot stone bath, and had many other wonderful and fascinating experiences, to enumerate all is beyond the scope here. Top highlight was a wedding ceremony in a temple organized for us by Karma (Bhutan was our honeymoon). If someone is interested in this wonderful country, he can trust in Karma and his team. Thanks for the great organisation of a culturally rich and exciting journey! Tashi Delek! What a successful stay in Bhutan it was throughout! Unfortunately we had only five days, but in these days, we experienced a lot. The whole thing was perfectly organised by Karma: good accommodations, great driver, lots of variety, knowledgeable guide - everything we could want. Many thanks! Dear Karma, we personnally owe you a big "thank you" for a unique and unforgettable experience in your country: Bhutan. You definitely widened our minds. We perceived the entire trip as authentic. You presented us your country as it is. You allowed us to enter your culture. This is what we were looking for. Any place you guided us to was fascinating, whether it was about history, religion or just landscape. We really enjoyed the time. At any time we felt warmly welcomed and perfectly guided. We wish you and your family all the best and hope that other people that may get to know your country will ask you to show it to them. Tashi Delek. Dear Bhutan - interesting! A journey with Karma is really rewarding. In a small group, we could visit that country with extraordinary flexibility. He allowed us to visit a festival in Trongsa, even though it was not really in our itinerary, we have seen black-necked cranes, had a hot stone bath, and experienced archers having a match. We both stayed in good hotels and in special farmhouses. It was a really pleasant and successful trip. Karma is extremely nice and helpful. The trip is hightly recommended. Over Christmas/New Year 2009/10 I made a tour with 2 friends with Karma. In the absence of more time, it was the usual tour to Bumthang and back. About the beauty of the country, the extremely pleasant handling, and the friendly, humorous and helpful dealings with the Bhutanese, I can add nothing new to the many entries in this guestbook, but I fully acknowledge it. Karma is a highly competent, trustworthy and nice guide. We always felt comfortable during the tour. The accommodation, including meals, was outstanding. As an experienced backpacker, I felt the standard was almost a luxury... We were very comfortable on the road with three of us in a four-wheel drive station wagon. Before travelling, we heard of a festival in the middle of the country and had asked if it was possible to visit it. Karma changed the travel plans in a thrice, and allowed us to cause him a lot of extra work with the organisation and manouevering. Last but not least, the pre-organisation (Druk Air) flight and visa procurement were also good, you can confidently pay in advance. If I desire to visit the country again, there can be only one: Jeroma Tours with Karma! Tashi Delek! Three glorious weeks in Bhutan! I as an individual visiting the small Kingdom in September/October 2009. The expectations for this trip have been far exceeded. For this I have to thank Karma Tenzin, the owner of the travel agency Jeroma Tours. First, I drove from west to east, from Paro, with a visit to the "tigers" of Thimphu, Punakha, Wangdi Phodrang, Phobjikha Valley, Trongsa to Jakar in Bumthang to Ura. The second part of the tour was a 7 days trek to the mountain village of Laya. A real challenge and an unforgettable adventure. Karma was not only a trusted leader, but also an expert on the culture of his country. In addition, Karma is a genius of organisation and responds very flexibly to the needs of small and large groups. The selection of hotels, food, and the entire service was simply perfect. Even his driver steered us safely and reliably through the winding roads, and our companions on the trek were always friendly and helpful. Everything was unique. Jeroma Tours by Karma Tenzin is a really competent and professional travel agency and recommended if you want to visit Bhutan. You can trust him blindly from the handover of the travel fee until the end of the tour. Thank you very much, Karma, for the pleasant stay and the good times we had together. I am proud to call Karma my friend. Tashi Delek! We spent an unforgettable time in a unique and fascinating country, not least due to our nice, experienced and professional guide! Thank you Karma for all your efforts! To whom it may concern: I would book anytime again with Jeroma Tours, as I was contented in all respects. I had the impression that, due to his long experience in organizing tourist tours, Karma perfectly understands to respond to the needs and wishes of his clients, besides his sound knowledge about his own and other cultures. We are back from a wonderful journey across Bhutan from Paro after Samdrup Jongkhar. Thanks Karma, for great readiness to our wishes, it was an unforgettable adventure. Starting from the Tiger's Nest Monastery (which I mostly covered on horseback), through the Tshechu Celebrations in Paro, a hot-stone bath in the Phobjikha Valley, the guest house in the beautiful Bumthang valley, there were many high points, not least the wonderful picnics on the riverbank and the cinema in Thimpu! Tashi our driver must have big praise. He carried us by his thoughtful and careful driving through the many, many curves and steep slopes always with a secure feeling. We have just come from a trip to Bhutan and are enthusiastic about this country, its people and its culture. The trip was perfectly organized by Karma and Chencho. We had a German translater, which was very important to us, to provide a good understanding of the life and culture in his country. Dorji, our driver, steered us safely and reliably through the winding roads, so we could watch the grandiose nature. It was an unforgettable experience and we thank you Karma and his team. It was a magical journey through a wonderful country. Karma and Tashi have provided this by their experience, and the friendly dealings with us and all the other people we met. The selection of hotels, food, and the whole organisation could not be surpassed. Karma has done everything imaginable for us to make this trip unforgettable. Even the great weather, he somehow produced. Tashi, our driver, got us securely from one pothole to the next. Really a great country with great people. We visited Bhutan last October for about two weeks. The whole trip was an amazing time for all of us. It was perfectly organized by Karma. We had the possibility to participate in various Tsechus, and to trek through the beautiful landscape of Bhutan for about 5 days. But the thing I most liked about Bhutan were the people. All of us had done a lot of travelling over the years, but Bhutan was something special. Karma and Tashi, our driver, both became friends. We spent a lot of time together and got a lot of detailed insights into living in Bhutan. Karma and Tashi have so much knowledge and so many stories which they share with you. Whenever we will have the opportunity to come back to Bhutan (and we will definitely), Karma will be our choice again. Whenever we look through the pictures we have taken, we remember the smiling Karma and the honest Tashi. When you plan to visit the "last kingdom of the Himalaya", contacting Karma is the best choice to make. Sending him our greetings. Tashi Delek, Manni. This was a really great trip! Karma organised my journey very well. I really enjoyed the time with him and his colleagues, who were all very nice, helpful and knowledgeable, and continuously answered all the many questions I had. I had a lot of fun, but also a lot of special moments in the monasteries. The highlight of my tour was a three day trek, during which I had the opportunity to stay in a farmhouse and a monastery, and got a deeper insight into the life of Bhutan. Thanks to all the translation by my guide, I had the chance to talk more intensively to the local people, which was a very special and great experience for me. Thanks so much to Karma and his team, hope to see all of you again. My introduction to Bhutan was truly amazing – all thanks to Karma and Jeroma Tours. His service was exceptional and absolutely nothing was impossible! You had arranged the best rooms and hotels whereever we went. You ensured we were not in the foot steps of large tour groups and you took us to many fantastic hidden secrets of Bhutan – whether it be local restaurants, monasteries, view points, camp sites etc… We had the most incredible honeymoon. One we will never forget! Thank you Karma and Kinley. Second time in Bhutan, second time on the road with Jeroma Tours & Treks, second time a great and successful tour. We are enthused, thank you Karma Tenzing and your grand team. We travelled with Karma from April 28th till May 16th. It was a really great time. 14 days we spent trekking from Damji via Gasa, Laya, Chebisa, Lingshi, Jangothang to Drugyel Dzong. We crossed over many beautiful passes, such as Sinche La, Jhari La and Bhonte La. We visited some beautiful mountain villages like Laya and Chebisa with very kindly and nice people. We experienced a fantastic nature with an impressive botanical and animal world, such as we had never seen before (e.g. rhododendrons). Our companions, Phurba the cook; Vinzent, Dorji and Kezang the assistants; all our horse men; and Karma did a 100% perfect job. Besides the trekking tour, we visited Punakha, the capital Thimphu, and Paro. Karma guided us to temples, dzongs and other places of interest. Finally, we visited the most famous monument in Bhutan, Tiger's Nest Monastery, again and again we were impressed. Karma, thank you very much. Please give our thanks and best regards to your team and your wife. Jeroma Tours & Treks is our favourite travel agency in Bhutan. We shall come back at the latest in 2010. Tashi Delek. My trip to Bhutan in Feb 08, which I organized with Karma, has been fantastic. He is not only a cherished, trusted leader, but a very knowledgeable expert in the culture of his country. His driver and assistant Rinzen can only be praised. Anyone who contacts Karma can also trust him blindly with the transfer of the travel payment. I can only strongly recommend Jeroma Tours for a trip in Bhutan. Our two week trip in December 2007 was fantastic. Karma knows a great deal about Bhutan in all relevant cultural and religious areas, and is a gifted storyteller (especially after a few glasses of rice wine). He was alert to our physical well-being and care, showing great sensitivity if someone was uncomfortable. The organization of the trip was perfect and very individual. I shall have great pleasure in coming to Bhutan again! Our trip to Bhutan in October 2007 was a great experience. Everything was perfectly organised. Karma and the other guides were always friendly and extremely helpful. Especially Karma gave us lots of informations about the country, its people, landscape, history, and religion of course. He is a very knowledgeable man and he's got a nice sense of humour, so we laughed with him a lot. Thank you so much, Karma, for the great time we had together. I hope we'll see each other again one day. Tashi delek. Karma is a highly professional tour guide who is dedicated to his work. He is highly knowledgeable in Bhutan’s history and culture, but above all he is very well organized and goes the extra mile that makes any trip to Bhutan even more enjoyable. Last-minute changes in tour schedules are being managed the same professional way as changes as a result of bad road conditions or weather. He is definitely one of the best guides in Bhutan. I highly recommend Karma for a tour guide in the wonderful land of Thunder Dragon. I came to Bhutan as a guest but I left as a friend ! Tashi delek, dear Karma and see you again in September. We have just returned from our fourth journey through Bhutan with Karma, another trip where every day brought new adventures, experiences and vistas. His knowledge and experience, faultless planning, flexibility and attention to detail lead, as usual, to an utterly memorable and seemingly endless trip through space and time. His beautiful manners and frequent small acts of thoughtfulness and kindness added extra value to each day's activities. The perfect host and guide to this wonderful country. Thank you, Karma-la. Tashi delek - this means so much! But you can only understand the meaning if you experienced Bhutan - the small mysterious kingdom in the Himalayan Mountains. My expectations have been exceeded - and a major contribution on that is because of Karma. He was the real link between us and the country and its people. Without him it would have been an exceptionally landscape with dzongs, temples and smiling people. But with Karma, Bhutan became more than that - he gave the trip a soul, the country a face. So, thank you Karma for the great time we had this November and please take good care about you, your family and your fascinating country! Tashi delek. Dear Karma, thank you so much for the wonderful time we have spent together in your incredible country. Your experience, your nature and character form a perfect insider partner for Bhutan. We have met several other guides but none was like you! Tashi Delek - you will remain in my heart! Three fantastic weeks in Bhutan! We, five people from Jena/Germany, visited this small Kingdom near the Himalayas from October 16th till November 3rd in 2006. Before our visit we read and felt a lot about this fascinating country. But our expectations were excelled far and away. This was due to our guide Karma Tenzin, the owner of the travel agency Jeroma Tours & Travels in Bhutan! Karma is a very experienced and excellent expert on the Bhutanese country and people, as well as Bhutanese culture and religion. Karma pre-eminently adjusted himself to our wishes and visions. Firstly, we travelled from West to East, from Paro via Thimphu, Punakha, Wangdi Phodrang and Trongsa to Jakar in Bumthang and back. Monasteries, Dzongs, Farm Houses, monks, farmers, and children as well, amazed us again and again. The second part of our tour was a nine-day Jhomolhari Trek, a real challenge and unforgettable adventure. Together with Karma, a cook, two assistants, two horsemen, 12 horses and a lot of baggage, we experienced a little bit of the roof of the world, the Himalayas. We were continuously exposed to mountains, passes, rivers, yak herds, nomad families, and many other surprises. Jeroma Tours is a really competent and professional travel agency. We recommend contacting them if you intend to visit Bhutan! Thank you very much, Karma, for the nice stay, your hospitality and competent guided tour. Best regards to your team and your family. We will come back to Jeroma Tours and Bhutan at the latest in 2008 to undergo Springtime in Bhutan, to experience a new trek, and to learn more about the very friendly Bhutanese people and their country. Let me express one wish only in advance (maybe a challenge for Jeroma Tours too): where can we see and meet the Yeti in 2008? Tashi Delek! We travelled in Bhutan with our family in early September 2006. We were all deeply impressed by the way of life and the deep religiosity of the Bhutanese. Karma has taught us a lot about his country. The many stories about Buddhism which is still lived and practised were interesting. We could experience this ourselves when visiting the monasteries. Karma has always surprised us with local specialities. He was always anxious to make the trip as pleasant as possible for us. With pancakes from buckwheat made especially for me, he even resolved my problem of wheat intolerance. Many thanks from the heart, dear Karma, we are still deeply impressed by Bhutan and its amiable inhabitants. Karma has introduced us in a very friendly, merry and polite way in the exotic, rightly protected culture of Bhutan. We saw many dzongs and temples, and experienced an exciting wandering adventure. Karma was always anxious to fulfil our wishes. Even when the weather played against our trek he immediately had several alternatives at hand, so that our trip never became boring. Many thanks dear Karma! We spent a wonderful honeymoon in Bhutan, and felt so very good in this special country. We have travelled much in the past, but this was the nicest travel ever, full of unforgettable moments. Thanks to the proficient guide Karma Tenzin we were introduced soundly to the complexities of Tantric Buddhism, and visited many monasteries and dzongs and other worth seeing places. Now we love this country, with its overwhelming nature, its deep spirituality, and its kind people. We would like to recommend our guide, who always tried to anticipate our every wish, and we would be happy if many other people became acquainted with this special land under his care. Patiently, he lead us, not very athletic people, in our slow progress through the landscape, and organised horses to facilitate a faster climb, although he is mostly used to guiding more ambitious and physically more demanding trekking tours in the high Himalaya for the past 25 years. In deep friendship, we still feel very close to him, and look forward with great joy to our next travel in Bhutan that we plan for next year. Thank you, dear Karma! Tashi Delek! If you are ready for an exceptional travel experience that shows you another way of living, and forces you to reflect about the positive and negative aspects of our modern world, then you have to go to Bhutan. And if you have a thousand questions about Bhutanese history, religion, tradition, nature and people, then you have to travel with Karma Tenzin. I was so impressed by this great country! A happy nation living in a superb landscape and trying to combine tradition with technical progress. Thank you Karma for your endurance in answering all our questions, and for your convenient manner of guiding us! I was really impressed by the beauty of this country! Our journey started in Paro, going via Thimphu to Trongsa. We saw monasteries, beautiful landscapes, and the everyday life of the Bhutanese people. It was very good to have the opportunity to discuss things with Karma, he knows the country very well and he enjoys talking with people that are interested in his country. I will remember this fascinating country always. As first-visitors to Bhutan, we had a wonderful time in a very special and beautiful country. Karma knows really quite everything about buildings, sights and regions. His quiet, calm kind of explaining and deep insight has lead to us to a wonderful experience, and - it does not matter where - he knows someone for sure! That's amazing. We loved being there and look forward to visiting Bhutan again sometime. Thanks a lot for all the beautiful sights, encounters and descriptions. Bhutan is most beautiful with Karma and Jeroma Tours. May the good dragon be with you all. Best wishes from Switzerland. Thanks to the good organisation and friendly service of Jeroma Tours we enjoyed a smooth and joyful trip through the West of Bhutan! Our friendly driver brought us safely across the long and winding roads and we visited many fascinating sites along the way. Through Mr.Tenzin's personal care and hospitality we could also enjoy some insights into the daily lives of the Bhutanese families giving us a good impression of the rich cultural heritage of Bhutan as well as the friendlyness (sic) of the people! Thank you for a great and unforgettable trip! We first met Karma in 1996, when he guided us on a tour of sacred places in Western and Central Bhutan, including a brief trek to a remote monastery. We were so delighted with every aspect of the arrangements, and, in particular, the knowledge and personality of the man himself, that we have been in touch ever since. We travelled again with him in 1999, when we visited the far East of Bhutan. At the end of that trip, he arranged a surprise for us. He had obtained permission for us to stay overnight in a small remote temple associated with Guru Rinpoche, and rich with his relics, that had never been visited by Westerners. This remarkable experience included an open-air hot rock bath in the dark in the surrounding jungle. Unforgettable! We last travelled with Karma, for the first time under the auspices of his own, excellent, small travel agency, where everything is under his personal supervision, in 2004. The major focus of this trip was to attend an unusual festival in the far East of Bhutan. A truly magical experience. Photographs from this trip can be found here. We plan to return to Bhutan in 2008. I cannot recommend Jeroma Tours & Treks too highly. Whatever your requirements, if it is within the realms of possibility, Karma can make appropriate arrangements. You will also benefit from the company of a highly informed, efficient, unflappable and charming host, a man I am proud to call my friend. Travelling across Bhutan with Karma is like one long reunion. In towns, villages and at the roadside apparently in the middle of nowhere, we bumped into extended family, friends and officials to whom we paid respects. Due to his extensive travels across this magical country, it seems there is almost no-one who does not know Karma Tenzin. He is a national treasure in a land of treasures. I am always sad to leave and delighted to return. See you soon Karma. Looking back on our 25-day tour through the back country, the villages and holy places in Bhutan, we are even more aware of the singularity of our experience and the extent to which you, Karma, were responsible for making it possible. Our nephew Roger had assured us you would take care of us and see to our wishes, but we had not expected such a meeting of minds when it came to the most diverse topics of interest, such as iconography, the life of the monks and farmers, the natural history by the wayside, linguistics and politics. To our surprize, we found that the services provided during our treks and at campsides made us comfortable at all times, the cooking was excellent and the assistants truly helpful. Thanks to your showing the way, we learned that Bhutan is not only a country of mountains, monasteries and magic, but primarily a country of friendly people. For this we are most grateful. Tashi Delek! In October 2004 we were in Bhutan - amongst others on the Lunana-Trek - and can highly recommend Jeroma Tours to everybody considering an individual trip to Bhutan. The tour was perfectly organized by Karma Tenzin from the beginning to the end (mules, yaks, trekking support team, and accommodation in beautiful local lodgings, visit of a Tsechu festival etc.). 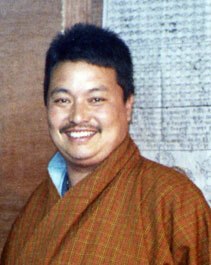 With his extraordinary friendly manner, Karma understood how to bring us closer to the land and the people of Bhutan. The tour was a unique experience. Result: We would return again whenever possible. We made an - alas too short - trip with Karma to central Bhutan, which was well guided and accompanied by overnight stays in beautiful local hotels. The excursions were well balanced over the day. We felt welcomed guests whose individual wishes were completely fulfilled. A recommendation to those who do not want to travel with the masses. On my Bhutan trip with Karma Tenzin I especially enjoyed that Karma knows the land and the people so well. Thereby we could have very interesting experiences. As a designer of fashion I was especially interested in the Bhutanese dresses and costumes. My questions regarding those were answered by Karma so completely that I gained a really true impression. Karma also made it possible that I got to know fabrics and dresses close-up; and I am happy each time I think of it or look at the nice souvenirs at home. In Spring 2001 I was with an Austrian travel group on tour with Karma Tenzin, and perceived it as very valuable that Karma - due to his trips to Austria and South-Tirol - knew our interests and circumstances of life very well too. He always seems to anticipate the interests of his guests in advance. This revealed wonderful impressions of the trip to us. Moreover, Karma is a true genius of organization, and reacted very flexibly to the small and large wishes of the tour participants. The care was simply perfect.